Dine Out Vancouver 2019 kicks off this weekend at various locations around the Lower Mainland. Check out Prix Fixe Menus ranging from $15 – $45 at over 300 restaurants. Lots of options and a great way to try out a new restaurant. To see which restaurants are participating this year, visit Dine Out Vancouver. Vancouver Brewery Tours is offering a delish dining experience featuring Italian food and great local beer. Get picked up at Waterfront Station and you will be driven to each location in your tour which is 3.5 hours. Check out behind the scences to see what happens at the local breweries, taste beer and have some great food, maybe make some new friends. Cost is $99. For tickets, visit Dine Out Vancouver. The Firehall Arts Centre brings the music of a Canadian icon to the stage again this weekend with the Circle Game: Reimagining the Music of Joni Mitchell. A stellar line up of musicians will be performing her songs as of this Saturday. For tickets information, visit Firehall Arts Centre. The Open House is offers something a little different than your usual family drama where all problems are solved in 2 hours. Instead this is billed as a wildly subversive and darkly funny take on family drama. Production takes place at Havana Theatre Friday night and Saturday there’s a matinee and evening show. Tickets are $27 – $25 and available through Showpass. Do you love beer? Have a partner that loves beer? Not yet made plans for Valentine’s Day? The good folks at Vancouver Brewery Tours have a fun event for you. 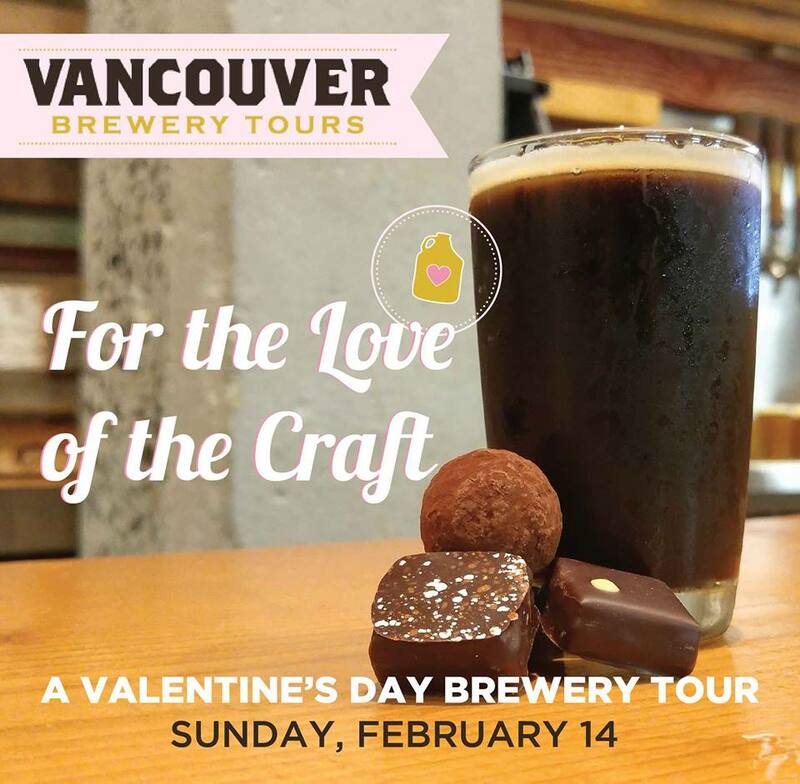 Their popular For The Love of Craft Beer Tour is back for Valentine’s Day which in case you missed it falls on a weekday this year, Tuesday, February 14th. One of their knowledgeable guides will tour you to 3 breweries starting with Brassneck Brewery. Next up you will head over to Storm Brewing where we hear they have some special Valentine’s Day-themed brainstorm beers. After that, your guide will take you to Big Rock Urban Brewery & Eatery for beer tasting and dinner. The tour guides are filled with fun facts about the Vancouver beer scene, so bring any questions and your thirst. This tour runs from 4:00 pm to 8:00 pm. Cost is $89.99 per person. If you are not a beer lover, or don’t drink alcohol, but wish to go with someone that does, ticket cost for you is $70.00. To book your spot, visit Vancouver Brewery Tours. There is limited seating so book quick if you want to share a fun experience on Valentine’s Day. Looking to do something different with your partner this Valentine’s Day? If you and your partner are beer lovers, than Vancouver Brewery Tours has something for you. They are offering a craft beer and food tour called the “For The Love of Craft” on Sunday, February 14th. They will take you on a tour of some great local breweries including Storm Brewing, Strange Fellow Brewing and Big Rock Urban Brewery & Eatery. There will be food along your beer sampling route as well as finishing the whole day off with some decadent chocolate from local chocolatier Thomas Haas. The For The Love Of Craft Tour runs Sunday, February 14th from 2:00 pm to 5:30 pm. Tickets are available from Vancouver Brewery Tours for $85 per person. UPDATE: 2:00 pm tour is SOLD OUT, but a second tour has been added at Noon.